After school the other day I decided it was time to get the Fimo out. The children really love crafting with Fimo and they've made some lovely things in the past. I must admit that it can get a bit frustrating, as the children don't have enough strength or patience to work the clay and get it soft enough to use, so I spend quite a lot of time rolling bits of Fimo round and round for them to use! 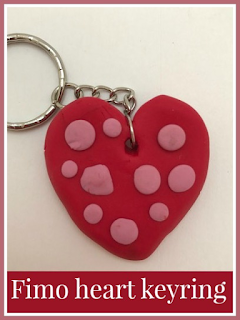 So we made some Fimo hearts, with me making the heart shaped background and the children using smaller pieces of Fimo, which are easier for them to manipulate, to decorate them. To make the heart base you need a ball of Fimo about the size of a large grape. Squash it flat and pinch at the bottom. Use a knife to cut out a small triangle at the top, and mould it round to form a heart shape. It should be about 1/2 a centimetre thick. Then use smaller pieces of Fimo in different colours to decorate. Make sure that you press all the pieces together firmly. If you want to turn your hearts into keyrings then use a skewer to make a hole in the top before you bake them. When they are finished you can bake them in the oven. Check the instructions on the packet, I use an oven with a temperature of 110 C and leave them in there for about half an hour. Then leave to cool before touching them. If you want to turn your heart into a key ring then you can use the hole in the top of the heart to attach a keyring chain (I needed to extend mine a bit with some thick wire to go through the hole). 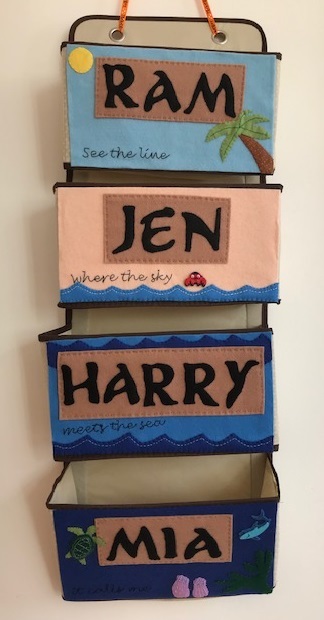 It's probably best not to use it for keys that get a lot of wear and tear as you don't want it to get damaged, but it would be great for a school bag or book bag! You might also like my other Fimo crafts - I made a Fimo owl, some Fimo Christmas decorations, and some Christmas Fimo bits and pieces for the dolls house.